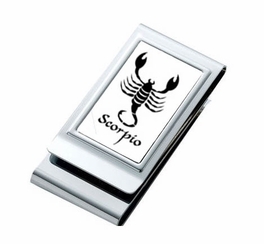 This money clip comes with any astrology sign or symbol of your choice. This handsome money clip is the perfect accessory to replace that bulky wallet weight down your pocket. Slim and lightweight, silver plated engravable metal. Holds bills and cards.